President Gerald Ford and First Lady Betty Ford’s luxury home is now available as a vacation rental at the exclusive Thunderbird Country Club in Rancho Mirage, CA. Offered by Oranj Palm Vacation Homes, it features 5 bedrooms and 6.5 baths with spectacular golf course and mountain views. President Gerald Ford and First Lady Betty Ford’s Estate is now available as a vacation rental in Rancho Mirage, CA, a city known as the retreat of national and world leaders, as well as Hollywood’s A-list celebrities. An architectural and design wonder in its own right, simply known as "The Ford Estate" is now offered by Oranj Palm Vacation Homes (OranjPalm.com). This was the 38th President's home after leaving the White House in 1977. It has been masterfully updated by the new owners who enlisted designer, Darren Brown, and architectural firm, Marmol Radziner to provide all the modern comforts, conveniences and style, while maintaining the integrity of the original architecture and fabulous ‘70s modern influence. Purchased fully furnished from the Ford family in 2012, some of the original decor has been maintained and restored or repurposed, now described as “‘70s elegance meets American Gigolo." 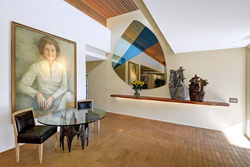 It's Gerald and Betty Ford's house, but it’s even better than they imagined it when they had it custom designed and built for them by well-known modernist architect, Welton Becket, in 1977, including interior decor originally created by Beverly Hills celebrity decorator, Laura Mako. “The Ford Estate is one of the most exclusive properties offered as a vacation rental in the Coachella Valley. It’s the perfect way to blend luxury with privacy and escape the busy hotel and resort scene,” says Thomas Salinas, president of Oranj Palm Vacation Homes, the exclusive property manager of this property. This amazing house is filled with original pieces throughout the house from the Ford family, including the seven-foot-tall portrait of Betty Ford in the entry hall, which was hung in the White House during President Ford’s time in office. A Desert Modern style of architecture including a broad expanses of glass, a flat roof with sun-shielding overhangs and fluid indoor and outdoor private spaces, adorns this magical piece of land. In terms of privacy, there’s a great separation of bedrooms at The Ford Estate, with five master suites in three different wings of the home. The primary master bedroom, formerly the President and First Lady's private suite, is just off the living room and features a sitting area, private patio and generous bathroom with Betty's dressing area, custom soaking tub and separate shower and a walk-in closet. The dining room is presented identical to when Betty and Gerald lived here. The original custom painted wall mural and chair fabrics add color and fun to the experience, including a butler's pantry which leads to the beautifully updated chef’s kitchen which now boasts high end appliances, a wine refrigerator, double ovens and dishwashers and a huge island. The sliding wall of glass disappears into the wall to open the kitchen up to the pool deck, effectively creating a pass-through bar where guests can sit outside and chat with those in the kitchen, without getting in the way. The location couldn't be better, as The Ford Estate is tucked into one of the most exclusive areas of Rancho Mirage, in the heart of the Coachella Valley, between Palm Springs shopping and restaurants at the west end and the Indian Wells Tennis Garden and Coachella Music Festivals at the east end. Rancho Mirage sits at the base of the Santa Rosa Mountains with amazing views of the San Jacinto Mountains. Well known as the retreat of national and world leaders as well as Hollywood celebrities like Frank Sinatra; it is also famous for the Annenberg Estate known as Sunnylands, which continues to be a premier retreat destination for international conferences among world leaders. Even our current President, President Obama, is rumored to be buying a home in Rancho Mirage, with his sixth visit in three years to the California desert, where he could live full time once leaving the White House. The Ford Estate is an estate fit for a king, or in our case, a former President. Come vacation like a world leader. You won’t regret it. For more than 40 years, Oranj Palm Vacation Homes, previously known as Palm Springs Rental Agency has provided first-class vacation rental services to local and international vacationers and customized property management services to owners of homes, multi-family buildings and commercial spaces. Oranj Palm offers the perfect "Home Away from Home” with professionally managed rental homes, condos, golf villas and luxury estates in the Coachella Valley, including Palm Springs, Cathedral City, Palm Desert, Indian Wells, La Quinta Indio and Rancho Mirage. Oranj Palm is the only agency in the area with reservation agents available 24/7 as well as online booking.